This design is the fourth in a series called Parade of Pattern which features projects that explore common stitches in an uncommon way. 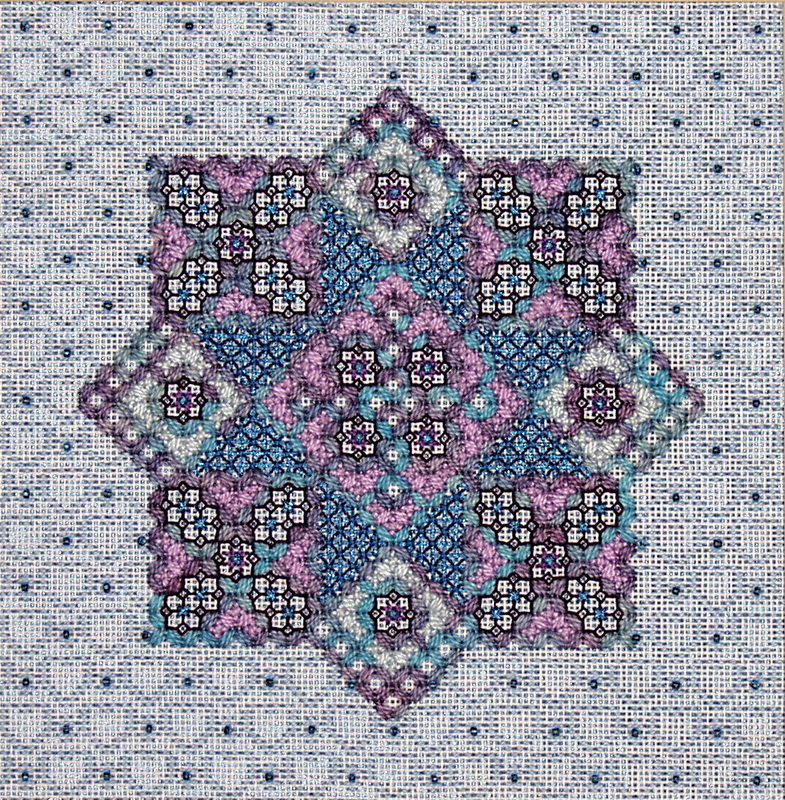 In this geometric arrangement, a variation of the Hungarian stitch called Flip-flop Diagonal Hungarian is used to create a main outline that resembles a rickrack edge. The four-way square and diamond arrangement is enhanced by a dramatic star in the center, and these areas are embellished with accents of canvas stitches, blackwork outlines and couching patterns. The background area is decorated with what I call a simulated darning pattern that is beaded. Any two colors can be combined in this design as long as the values substituted are the same. Seed beads: bright blue 10mm rocailles. NOTE. The model uses silver-lined Czechoslovakian beads that are not normally found in needlework shops, but effective substitutes can be used as long as the size fits either a #8 crewel or #28 tapestry needle. Needles: Tapestry #22, #24, #26 and #28 (for beading).